William Washington Hawkins is the great-great grandfather of San Jacinto Descendant member Michael Allen Lemen. William’s picture here is estimated to be taken around 1860 in his late 50’s. The photocopy is in the San Jacinto Museum of History library image collection. Why would an 18 year old young man travel from Missouri to a scarcely populated Texas colony under Mexico’s rule in 1830? Maybe to seek land, fortune, and adventure in an unsettled area as did his father John who joined in and fought in the American Revolutionary War. Maybe it was his connection to the Austin family (Texas Land Empresarios) in his home county of Potosi, Missouri. Either way, William found land and adventure along with danger, war, and fortunes gained and lost. Once arriving in Texas, William lived there the remainder of his life until passing at the age of 74 in Lee County in 1886. 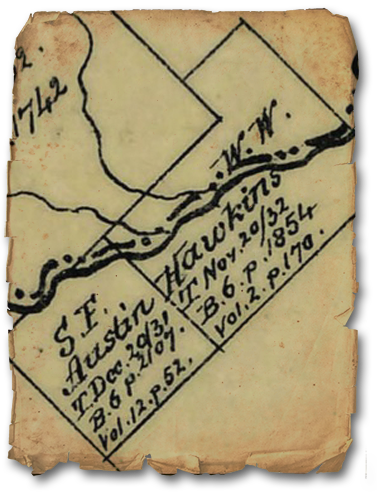 William was born in Missouri in 1812 where his father John was friends with Moses and Stephen F. Austin, so it is not surprising that William’s first land grant in Texas adjoins a Stephen F. Austin land grant as seen on the 1898 map to the right of Washington County. William’s land was granted in November 20, 1832 and sits halfway between the cities of Brenham and Caldwell, Texas. The dashed line separates Burleson County to the north and Washington County to the south. The solid lines are the Yegua Creeks running through the land. In July 1835, William answered the call for help as Indian attacks were taking place in Texas to the north. He joined a company of Texas Rangers with the purpose of defending the frontier against Indian depredations. William mustered at Fort Tenoxtitlan near Caldwell and rode with several companies to Fort Parker near Waco where they joined another company and formed the first true battalion of Texas Rangers. There had been companies of Rangers in Texas in the 1820-30’s, but this was the first time a group of companies joined together and formed a battalion according to the book Savage Frontiers volume I. The battalion ranged the area but disbanded within months after a lack of extensive confrontations. William was at the Storming and Capture of Bexar from December 5-10, 1835 in what is also known as the Siege on Bexar when Texian forces ousted the Mexican soldiers under General Cos from San Antonio. This set the stage for Santa Anna and a large Mexican force to march to San Antonio and arrive February 23, 1836 in an attempt to stomp out the Texian Revolution. In early March 1836, William mustered in Gonzales with General Houston’s army to prepare to assist the Alamo. He remained with the Texian Army through the Runaway Scrape and the Battle of San Jacinto in April 1836. Many of the men in his Texas Ranger company were also in his company at the Battle of San Jacinto in Captain William W. Hill’s Company H of the First Regiment of Texan Volunteers under the command of Colonel Edward Burleson. The gun pictured above is a converted cap and ball musket manufactured by the Sichling Brothers of Potsdam, Prussia in the early 19th century and is on display at the San Jacinto Monument museum as the gun taken into the Battle of San Jacinto by William’s brother-in-law Ashley R. Stephens. Ashley was one of the nine Texian men who died from their wounds in the battle and William was executor of Ashley’s will. William was honorably discharged May 30, 1836 and allowed 8 days to return home. Could the instructions on the discharge papers of allowing 8 days have anything to do with Ashley’s death such as extra time needed to also take home Ashley’s possessions? How would it feel to be 24 years old having fought for and won Texas’ independence side-by-side with your brother-in-law then to leave the battlefield for a long trek home without your friend / sister’s husband? All of these soldiers took that risk. 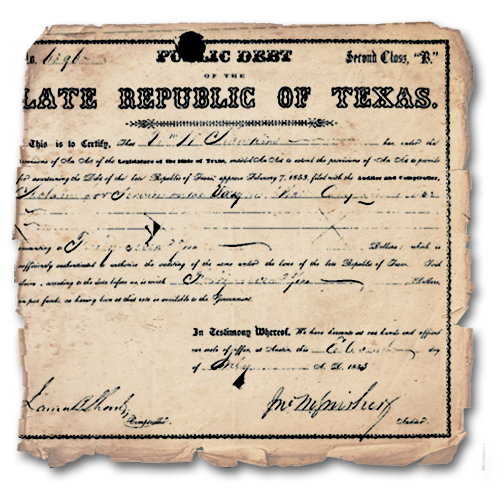 William received three donations of land for his military service after the Texas victory: Donation Cert. No. 170 on May 22, 1838 for 640 acres of land having fought in the battle of San Jacinto; Bounty Cert. No. 3871 on June 18, 1838 for 320 acres of land for serving in the army in 1836; and a Veterans Cert. No. 1051 on May 4, 1883 for 1280 acres as a surviving soldier of the Texas Revolutionary War. In the Spring of 1842, William and his brother Isaac took up arms, mounted, and equipped themselves in military service to drive out Mexican invaders, who were led by Mexican General Rafael Vasquez, from San Antonio to Mexico according to an online Republic of Texas claim document. This was known as the Vasquez Campaign of 1842. In the Fall of 1842, William allowed his 19 year old nephew Lionel Brown to substitute for him in driving Mexican invaders, led by Mexican General Adrian Woll, from San Antonio to Mexico in what was known as the Woll Invasion of 1842. William paid Lionel $25 and furnished him with a horse to mount. Lionel later died without issue and without receiving payment for his military services. Consequently in 1855, William received the Public Debt paper pictured here in the amount of $67.5 for 3 months service through his substitute Lionel Brown. The previously mentioned Veteran’s Certificate of 1883 is the subject of a letter from William to Moses Austin Bryan (Stephen F. Austin’s nephew) in the collection of Papers of Moses Austin Bryan. Therein William requested the favor of Mr. Bryan to travel to Lee County to testify and witness that William was in the Battle of San Jacinto, 47 years prior, in order to obtain 1280 acres as a gift via the recent state legislation. William reasoned in the letter that Moses Austin Bryan and 3 others named were the only veterans still alive that knew he fought in the battle. William offered to pay Mr. Bryan’s coach and hotel expenses. The letter must have worked, because William obtained the necessary witnesses and received the certificate of land. As many veterans did at the time, William sold the certificate at a deep discount rather than going through the long process of converting the certificate to a specific piece of land. William was 71 years old at the time. William settled down and married in 1847 to his first wife Sophia Ridgeway who died in 1848 after childbirth of their first son. His second marriage was in 1851 in Caldwell, Texas to Jane R. Edwards, daughter of Dr. William Edwards and Mrs. Ellenor Hood Edwards, of Burleson County, Texas. 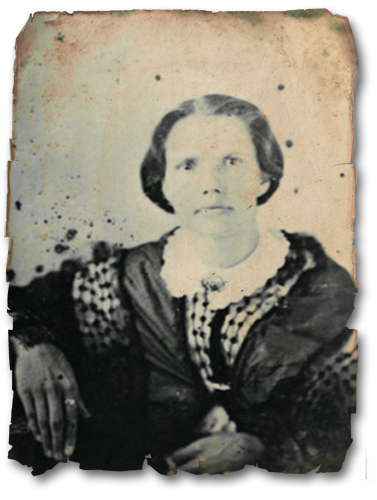 Jane’s picture here is estimated to be taken around 1860. William and Jane lived in Lee County and were buried beside each other in the Early Chapel cemetery near Lexington, Texas. The Texas historical marker at William’s cemetery recognizes William as a Texas Ranger and Soldier in the Battle of San Jacinto in 1836. William and Jane had eight children the last of which was Eugene “Dean” Adolphus Hawkins. Eugene was 18 years old when William died and thereby inherited a share of a tract of land, in Williamson County south of Austin, amounting to about 150 acres. Three years later at the age of 21, Eugene sold his land for $4 per acre and began pioneering in West Texas as a rancher and farmer. He died in Rotan, Fisher County, Texas in 1945 at the age of 77. What would 150 acres in Williamson County be worth today? Texas land is a valuable resource. One of Eugene and his wife Emma Williams’ son was Beauford Eugene Hawkins (William’s grandson) who was born in Fisher County, Texas in 1908 and died in Brownwood, Texas in 2000 at the age of 92. Beauford was a mechanic. Beauford and his wife Addie Keith had a daughter Doris Geneva Hawkins (William’s great granddaughter) who was born in Rotan, Texas in 1947, died in Corpus Christi, Texas in 1996, and was buried in her long-time prior residence Abilene, Texas at the age of 55. One of Doris and her husband Robert Lemen’s son was Michael Allen Lemen (William’s great- great grandson) who was born in Abilene, Texas in 1965 and is living in Houston, Texas as a 5th generation Texan. In 1985, he worked in the oilfield in the area where William settled in Texas in the 1830’s without realizing at the time he was literally walking in his ancestor’s footsteps. He is a Petroleum Engineer from Texas A&M which also is located near William’s area of settlement and has a law degree from South Texas College of Law. Michael’s oldest daughter is Madison Lemen who is a Texas A&M graduate living in Houston, Texas. 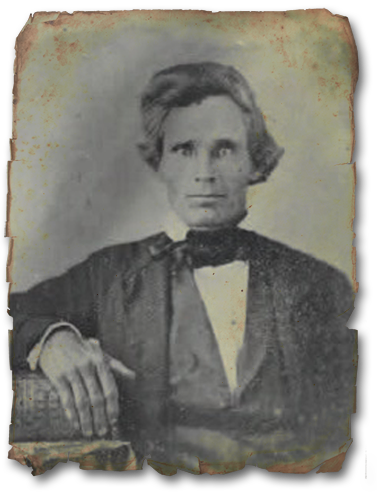 There is a family story that William Washington Hawkins was once one of the richest men in Texas before the Civil War. He went to bed rich one night, and awoke the next day without a cent due to Confederate money losing all value. Thankfully for him he still owned Texas land.